We didn't make much progress during last week, but by Thursday we were both back in there working away. After he had mudded the patched drywall earlier in the week, B gave it a quick sand and mudded once more to fix up any imperfections in our wall. I didn't want to give myself a chance to sit down and suggested we get right to work painting. I'll be honest, I wanted to keep the walls simple and bright, so we went the really simple route. We literally bought a can of Olympic's Zero VOC paint right off the shelf, no colour added, in a Satin Finish. I really just wanted a true white on our walls. We also used our free ceiling paint from when I attended the taping of Steven & Chris in October. Yup... that's trim around our nightstands, and baseboard along the bottom of that wall. B only had enough to do the one wall, so he finished it up hoping that we would be able to get the bed in place quickly and put the rest of the baseboard on later. The title may not have given it away... but B worked hard on Sunday, and we got to sleep in our room that night. It's not finished yet, as we still need to finish baseboard, get our headboard made, get the red dresser out and add some artwork (and possibly a new light fixture)... but for now, we're loving it. 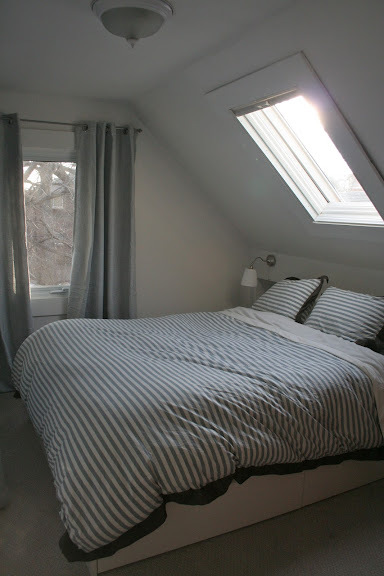 Our curtains over the window and closet also need to be hemmed, but they work perfectly with our Dwell Studio duvet. Even as it is now, it's much more of a relaxing retreat for both of us. I don't hate our bedroom anymore (our old one had turned into somewhat of a storage area), and I love how much higher our bed is... it's much less likely that we'll wake up with dog noses shoved in our faces. The best part is that now that's it's liveable, we can work on getting the old bedroom cleared out and cleaned up and start thinking about a nursery. So far, we're happy... and we've definitely come a long way from our blank slate room only a few weeks ago! What do you think of our new (still in progress) oasis? Oh my goodness Kerry! The lighting and nightstands look so good! As does your Dwell Studio duvet. You guys are a DIY machine! This room looks amazing so far, can't wait to see what you do next!! What a difference. I love that Duvet cover. It looks great!! The built-in-nightstand-things are so practical, but they look great too! Can't wait to see the finished room! The rooms is really coming together! You two are busy! Love the duvet cover! Looks so great already, can't wait to see it all together. Looks Great Kerry. Very restful. You guys have done a lot of work. that looks amazing, and so restful! great job, you guys! Well done! I love the duvet set and the built in shelves and lights. You guys get so much done! Wow looks ten times better! The built ins and the lights really make the space. I have to ask how are you going to block out the light from that skylight right over the bed? Thank you so much everyone for your kind comments! We're loving our new bedroom! I love it, Kerry!! What a difference, it looks soo good! I can't get over those built in side tables, such a fantastic idea! The room really is peaceful and serene. Weird question. How the heck do those blinds work on the slanted window!? I'm loving the built-in nightstands with the lights over them, what a great idea! I would never think to do that, way to maximize that space!! Love, love, love it! It's so soothing and calm. I love the muted light colors. It's like a big fluffy cloud in their. And I'm super loving the skylight.